These laminated pieces of cardboard represent a relentless pursuit of a lifelong dream. The time, effort, and energy that a single rock and roll band went through to make a name for themselves. It's almost more that I can comprehend. I look at these and I see the countless miles traveled, thousands of shows played, and the millions of people that went to those shows who danced, smiled, and sang along to their favorite songs... I was but a single person at a single show, but these represent so much more. Think of all the synchronicity that had to take place for just one person to go to just one single show. As with anything in life, it's a chance you take when you decide to put yourself out there. If you desire to reach a certain goal, at some point in time you have to take risks, which can mean putting yourself at someone else's mercy. As a fan, I can look at these badges and appreciate everything involved that happened to bring them into existence. It makes me feel better each time I buy a CD or a concert ticket, to know that the efforts of a single person can make me a part of something so much bigger than myself. These laminates were on loan from Jim Donovan. 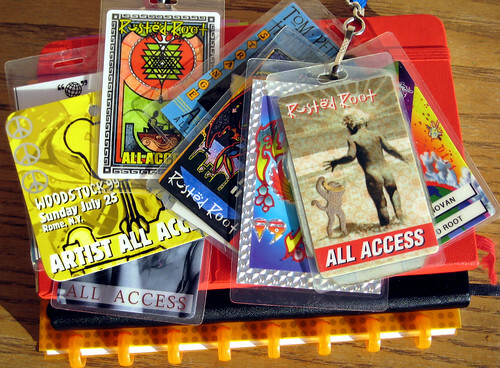 Want to read about his journey with Rusted Root and beyond? Check out his blog: Rhythm :: Ecstasy :: Evolution. Wow! You have a Woodstock pass even.Pristine at that! I was there, but lost my pass/ticket along the way! Not exactly... That's from Woodstock 1999, and it's not mine - it belongs to a friend that performed there. Thanks for posting. The narrative is well done.